Adjustable New & Used Pallet Racks. 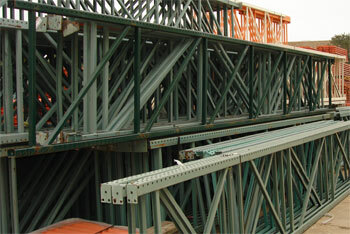 Industrial & Commercial Pallet Rack Systems & Installation. Adjustable used pallet racks by Easy Racks are available in used and new condition and are available throughout the United States. Used adjustable pallet racks are typically built in the boltless teardrop design. This highly efficient design allows for rapid assembly, minimal installation cost, and supports up to 35,000 pounds in weight. Many warehousing operations in Denver, CO, Phoenix, AZ, Santa Fe, NM, and Dallas, TX have found these adjustable pallet racks to be a very valuable component in weathering the current downturn in retail sales. They have found these storage rack systems offer them a vast improvement in managing backlogged inventory. By making better, more efficient use of vertical warehouse space, floor space is freed up for safer and more efficient foot traffic and vehicle traffic. It is easier to control inventory and keep accurate records when materials are organized on a pallet rack. This is particularly true for smaller warehouses that have relied upon other forms of shelving for inventory storage and control. Warehouse pallet rack shelving can and does offer tremendous value for certain types of material storage, but it is limited in terms of vertical storage space and shelving depth. Many materials currently being stored on long span shelves can be palletized and placed on an adjustable pallet rack system that offers much more depth and vertical storage space than current shelving systems allow. Workers can then create even more storage space by adjusting the height of each shelving system on the pallet rack. . This allows storage of a wide range of products or materials, all with differing heights, and can also allow non-palletized containers to be added to the inventory by devoting entire sections of the racking system to specific items. Warehouses in port cities like Los Angeles, Miami, Houston, San Jose, and Charleston can systemize and safely store any range of products coming in off ships with a single, one-time investment in an adjustable pallet racking system whose “free height” can be varied 2-3” per level. At face value, this may not appear to be a great deal of room, but it actually is. This is normally all it takes for barrels and large crates to be stored on pallet rack decking. Other forms of shelving do not offer sufficient depth or vertical height to accommodate these containers; so many warehouses often store them temporarily on the floor. This is neither safe, nor efficient, especially if containers have fragile items inside, or even worse, hazardous materials. Adjusting the free height of the shelving area creates a more efficient, specific storage location for a these materials and frees up floor space for improved working conditions and safer fork truck traffic. Improved safety and efficiency can have two long-term, positive impacts on an organizations revenue stream. For one thing, the need to book overtime when the economy begins to turn around again will be significantly reduced if measures are put into place now to accommodate an increase in workload with existing staff on hand. Secondly, some commercial insurance carriers may be willing to reduce premium costs if an organization can prove than an adjustable pallet racking system provides improves safety for workers and better protection against damaged products that otherwise would be more vulnerable due to improper storage. Such ROI is only likely, however, when one works with an expert in adjustable pallet racks who can customize the system to the specifics of a facility and the dynamics of a company’s industry and unique process flow. Easy Rack specialists can and will do exactly than when you call today. Easy Rack carries a wide variety of commercial shelving, material handling equipment, used pallet racks, used pallet racking and modular prefab buildings installed nationwide. If you can not find what you are looking for call us toll free at 1-888-776-3720 and we will find it for you. Our home office is located in Houston, Texas with warehouses located throughout the United States that enable us to service all 50 states including New Orleans, La., Cleveland, Ohio, Kansas City, Mo., Mesa, Arizona, Virginia Beach, Va., Omaha, Nebraska, Oakland, California, Miami, Florida, Tulsa, Oklahoma, Minneapolis, Minnesota MLPS, Colorado Springs, Colorado, Arlington, Texas, Beaumont, Texas, Denton, TX, McKinney, Texas, Midland, TX, Killeen, Texas.